Update: Arnold Palmer died on September 27, 2016 at the age of 87. Farewell, Arnold Palmer. Golfer and octogenarian senior citizen Arnold Palmer was born on September 10, 1929 in Latrobe, Pennsylvania. Arnold's Latrobe Country Club greens-keeper and pro golfer father taught him how to play golf. 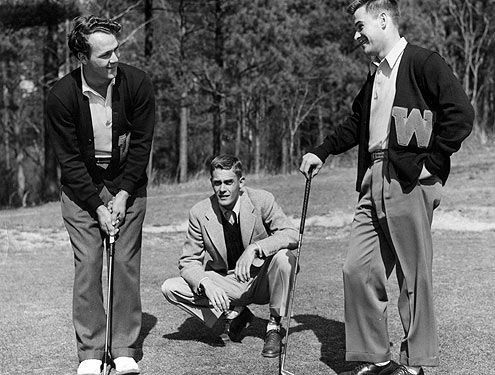 Arnold Palmer told PGATour.com that thanks to some prompting from his friend Buddy Worsham, who had already accepted a golf scholarship at North Carolina's private Wake Forest University, he was also offered a scholarship to Wake Forest. Palmer dropped out of college in 1950 after Buddy Worsham's death in a car accident; he had to identify the body. 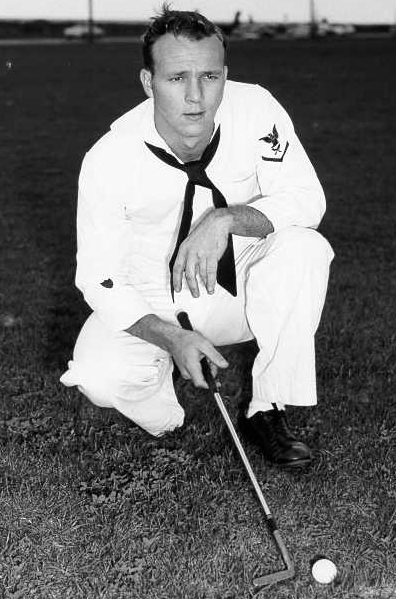 Palmer joined the U.S. Coast Guard, where he served for 3 years and continued to play golf, until 1953. After Palmer's Coast Guard service was up, he returned Wake Forest for a semester before quitting to become a professional golfer. Palmer established the Buddy Worsham golf scholarship at Wake Forest in 1960's, and later, the Arnold Palmer golf scholarship. Palmer has since funded a golf complex at Wake Forest University and a statue of Arnold Palmer in mid-swing sits on the grounds at the University. Palmer won numerous amateur golf championships he played in culminating with the U.S. Amateur golf championship in August 1954 a month before his 25th birthday. In his autobiography he recalled meeting 19-year-old Winifred (Winnie) Walzer soon after, at a Labor Day weekend golf tournament. Arnold proposed within a week of meeting Winnie and they eloped in December 1954; Winnie came with Arnold as he competed in pro golf tournaments on the tour in 1955. Arnold Palmer's first professional golf win on the pro tour that first year was the 1955 Canadian Open. Winnie and Arnold built a house in his home town of Latrobe, Pennsylvania and daughter Peggy Palmer was born in February 1956, followed by daughter Amy in 1958. Arnold Palmer began to rack up major championships in 1958 beginning with his first Masters Tournament win. He went on to win The Masters 3 more times (1960, 1962, 1964), as well as winning the U.S. Open in 1960 and The Open Championship in 1961 & 1962. From 1960-1963 Arnold Palmer won 29 PGA Tour golf tournaments; in 1960, Sports Illustrated named him Sportsman of the Year and he won the 1960 Hickok Belt as top pro athlete of the year. Other achievements included playing on six Ryder Cup golf teams (1961, 1963, 1965, 1967, 1971, 1973) and winning the Vardon Tropy for lowest golf score in 1961, 1962, 1964, and 1967. Palmer became the first man to reach $1 million in PGA tour career earnings in 1967. 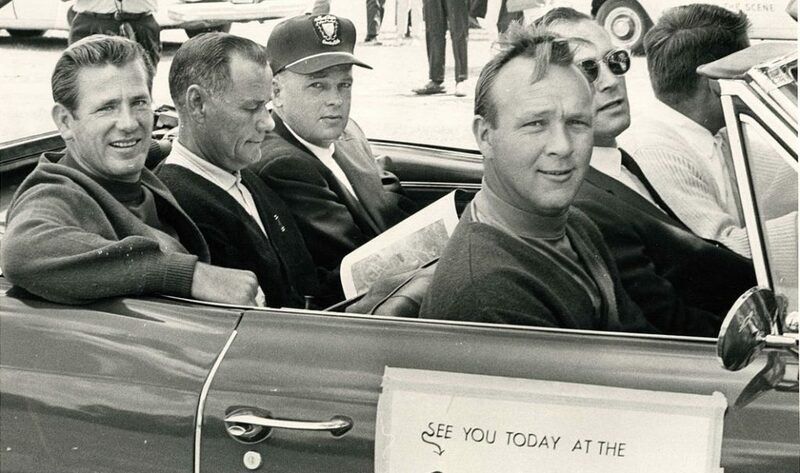 Below, Arnold Palmer and company at a 1961 event to open the Emeis Golf Course in Davenport, Iowa. Arnold Palmer's personal charisma helped raise the profile of golf and his own personal fan base was known as "Arnie's Army". 50+ Arnold Palmer's name recognition helped make the first season of the Senior PGA Tour/Champions Tour in 1980 a success, and he has won five senior majors. To confront his fear of flying, Arnold Palmer has said he began training as a pilot in 1956 on a Cessna 172 at the Latrobe Airport near his childhood home in Pennsylvania. Since obtaining his pilot's license, in almost 55 years of flying ending in 2011, Palmer logged close to 20,000 hours of flight time. The Latrobe Airport name was changed to Arnold Palmer Regional Airport in 1999, and a statue of Arnold Palmer wielding a golf club has stood in front of the entrance since 2007. Palmer has been a co-owner of a car dealership, Arnold Palmer Motors, in Latrobe PA since 1981. Left, a younger Arnold Palmer at Latrobe Airport with a rented Cessna 172. Arnold Palmer has been as successful off the golf course as he was on it. Five years after playing in a 1965 exhibition match at the Orlando/Lake Buena Vista Bay Hill Club and Lodge in 1965, Palmer became the principal owner of the club. The Orlando/Lake Buena Vista Bay Hill Club and Lodge became the winter home for Arnold and his family for many years, beginning in 1970. In 1979 the new Bay Hill Invitational golf tournament became a PGA Tour event, and was renamed the Arnold Palmer Invitational in 2007. Palmer also purchased the Latrobe Country Club where his father worked and he learned to play golf, in 1971. With business partner Ed Seay, Palmer Course Design was founded in 1972. The name was changed to the Arnold Palmer Design Company and moved to Florida in 2006. According to Arnold Palmer Design Company, their design of the new Chung Shan Hot Spring golf course in China in 1984, was the first new golf course in the country in more than half a century. 4 decades later, Arnold Palmer Design Company has designed about 300 golf courses world-wide, including the Beijing Cascades golf course which was voted the “Best New Course in China 2007-2008”. New senior citizen Arnold Palmer helped found The Golf Channel in 1995 and is a consultant for it. In 1997 Palmer had successful prostate cancer surgery and became a supporter of cancer research and early detection programs. Two years later, Arnold and group of investors bought California's famous Pebble Beach golf club in 1999. Later that same year, Winnie Palmer, his beloved wife of 45 years, died in November from complications due to ovarian cancer. 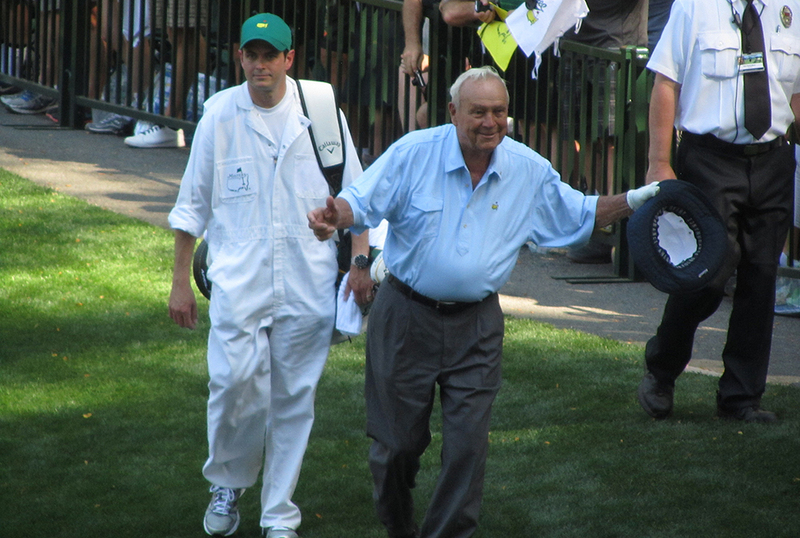 In recognition for Arnold Palmer's contribution to the world of sports, he was awarded the Presidential Medal of Freedom in 2004, the Congressional Gold Medal in 2009, and was named by Golf Digest magazine as the 6th greatest player of all time in 2000. 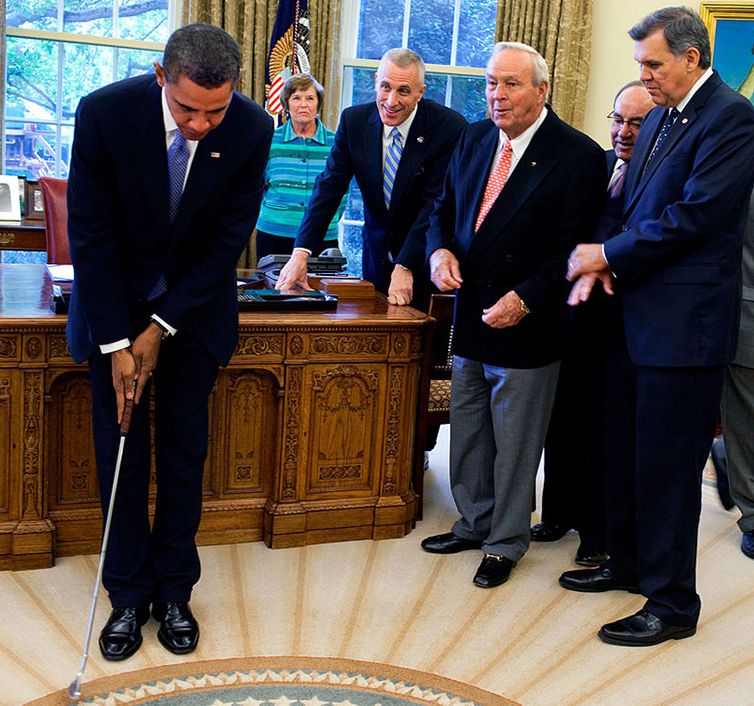 Below, Arnold Palmer watched President Barack Obama take a practice putt with a golf club Palmer had gifted to him. Grandfather and 75-year-old septuagenarian senior citizen Arnold Palmer married Kathleen Gawthrop in Kahuku, Hawaii in a private ceremony in January 2005. He told the Associated Press that "I've known her for a long time. We've been engaged for some time and dated before that. She's just very special,"and said the honeymoon had already started about 18 months before and "Hopefully it will last for another 10 or 15 years." Arnold Palmer retired from playing pro golf tournaments in 2006, but is kept busy with his growing family; he's now an octogenarian senior citizen and great grandfather (nine times over). He and Kathleen live in his home town of Latrobe, Pennsylvania during the spring/summer and they split their time in the winter between their golf course homes in Bay Hill/Orlando Florida, and the Tradition golf club in La Quinta, California. 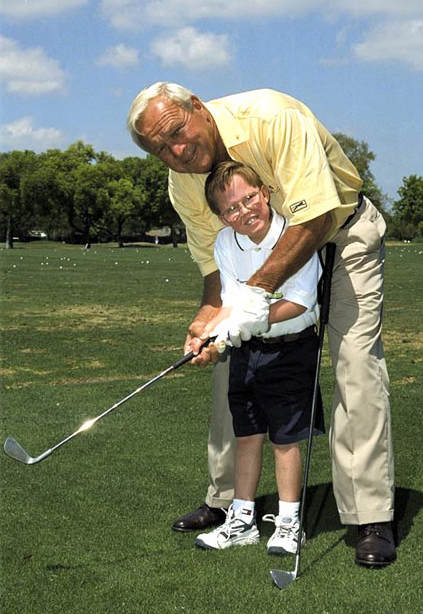 Happy 87th Birthday, Arnold Palmer! Memorial Service Music - Always on My Mind?